Cut all veggies in mouth-sized chunks. Add the rest of the vegetables as well as the chicken, beef or vegetable broth, thyme and bay leaf. 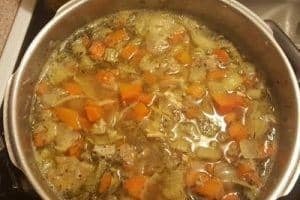 Boil and simmer about 20 min or until vegetables are soft. Take out the bay leaf. Add the chopped fresh parsley and season with salt and pepper. Cut wilted parts of the green tops off. Cut top part of leeks four times to split the large leaves, but keep the stalk together. Wash the tops in clean water very thoroughly. Leeks tend to hold on to dirt inside the leaves of the green part. Then chop all parts, including the green parts and use. Feel tired a lot? Worries "eating you up"? 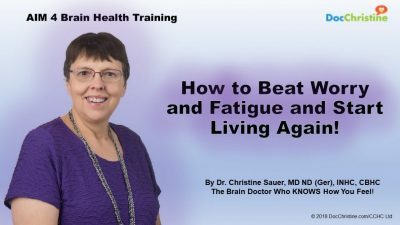 Get the FREE Video Course: "Beat Worries and Fatigue - Start Living Again!"